I use the stratigraphic record to reconstruct past landscape conditions on Earth. 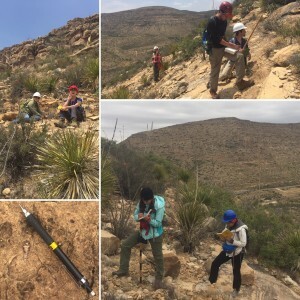 My research group focuses on learning about internal (autogenic*) variability that occurs in different sedimentary environments and understanding how Earth’s surface responds to change. Much of my research is focused on ancient deposits, so my group often conducts fieldwork in places with excellent outcrop exposures of sedimentary rocks, including the western United States. Additionally, we use numerical and physical experiments and observations from modern depositional systems for further insight. Several other Penn State Geoscience faculty are also interested in Sedimentology, Earth-Surface Processes, and Basin Analysis. Please visit the Department’s website for more information on these research programs. I am currently looking for motivated graduate students to start in 2019. Please see my research page for examples of the types of projects my students and I are pursuing. Information about applying to the graduate program can be found here. *”Autogenic” refers to processes that arise spontaneously in many sedimentary systems. Channel avulsion is an example of an augotenic process in river networks.